The term "Oriental rug" refers specifically to a variety of hand-knotted or hand-woven textiles of natural fiber produced in the vast area stretching from North Africa to China. Included in this territory are Spain, Egypt, Romania, Turkey (Anatolia), the Caucasus, Iran (Persia), Afghanistan, Pakistan, Turkestan, India, East Central Asia, and China. All Oriental rugs are named after the city, village or tribal group from which the designs originated. From each of these settings, one derives different types of rugs. Tribal rugs, such as Afshar, Qashqai and Baluch, were typically created in either a nomadic or village setting, using methods and designs traditional to the specific ethnic group to which the weaver belonged. Generally woven by individuals or entire families, tribal weavers employ designs which are geometric or abstract. Individuality and creativity are encouraged, imbuing each rug with a unique and spontaneous quality all its own. 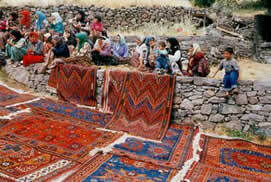 City rugs, such as Kashan, Sarouk and Nain, are made by groups of weavers in a workshop setting. These weavers primarily use floral designs linked to the great Persian Court carpets of the 15th to 17th centuries. City rugs typically have a tight weave and complex, carefully planned pattern. The pattern is drawn by a master artist, who strives to create an overall design and color combination which will endlessly impress and fascinate the viewer often using curvilinear patterns of swirls, tendrils, rosettes and arabesques. It is the weaver's task to follow this blueprint to perfection. DOBAG rugs on display in Turkey. 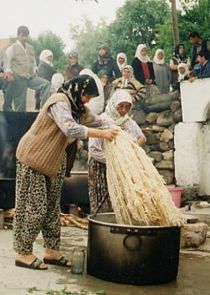 Village rugs, such as Heriz and Ferahan, bridge the gap between tribal and city weavings. Woven in workshops and homes in larger villages, these rugs usually depict floral designs that have been reduced to rectilinear proportions. Village rugs offer the flowing intricacy of city rugs coupled with the bold, playful quality of tribal weavings. One could say that tribal rugs are like folk music with the song or pattern passed down from mother to daughter by direct transmission. Village rugs are more like a repertoire of popular and traditional songs, through, like tribal rugs, the notes of the song are not normally written down. Classical rugs are like a Bach concerto where every note has been written down. Music and rugs have a great similarity, not only in creation but by the experience they can evoke. As the great Persian art scholar A.V. Pope wrote in 1926, "The elements of design are like notes in a melody or words in a poem. Rhythmical combinations of patterns give carpets a quality akin to that of music."